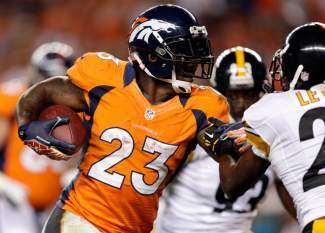 ENGLEWOOD — Willis McGahee’s decision to skip offseason workouts isn’t what cost the veteran running back his job with the Denver Broncos. The move wasn’t unexpected, but the timing of it was a bit of a surprise. The Broncos could have kept McGahee through training camp as an insurance policy against injury even if he wasn’t going to vie for the starting job. Instead, they sent him on his way just before wrapping up their three-day mandatory minicamp where McGahee had gotten just a handful of handoffs. “I’d like to thank Willis for everything he did. He did a great job for us, leading rusher. He was one of our first signees when we came here to get this thing turned around and it’s an unfortunate part about this business, but he did a great job for us,” Fox said. Even with Ball, who scored an NCAA record 83 touchdowns at Wisconsin, joining a bulked-up Hillman in the Broncos’ backfield, McGahee shunned the team’s three weeks of voluntary workouts this spring, something Fox insisted had nothing to do with Thursday’s decision to release him. Upon his return for the Broncos’ mandatory minicamp Tuesday, McGahee said he skipped the OTAs for family reasons. , insisted he would still be the starter come September and suggested that missing those 10 workouts didn’t put him at a decided disadvantage by giving the youngsters a head start. Now he’ll be looking to carry the ball for someone else. The 11-year veteran who was set to make $2.5 million in 2013 should draw interest across the league. Although he’s pushing 32, he’s doesn’t have the wear and tear that would be expected of a running back who has been in the league a decade because he spent much of his career sharing snaps. McGahee, who became one of the NFL’s most dependable runners despite tearing all the ligaments in his left knee during his last game for the University of Miami, tore the medial collateral ligament and suffered a compression fracture to his right knee in a game against San Diego last November and missed the rest of the year. Still, he led the team with 731 yards rushing. He also said he had been medically cleared to participate fully at practice, declaring, “I’m healthy. I’m clear. No problems. I can run,” and he said he felt he still had plenty of football left in him, especially with the way the rules severely limit padded practices now.